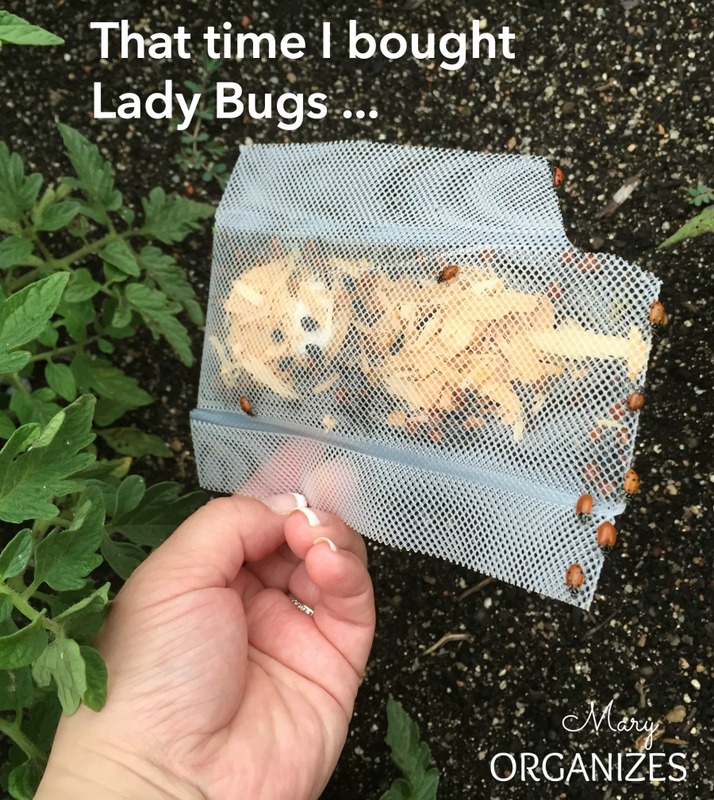 I really wish that I had written this post immediately after we released the lady bugs, so that I would still be optimistic that the lady bugs were going to stay around for a while and eat all the bad bugs from our garden. We did this last Wednesday, so less than a week, and today I was outside over half the day and didn’t see a single lady bug. Let’s rewind and start from the beginning. With our garden space growing, our garden pests seem to be growing too. Ick! And I don’t want to just spray chemicals all over the plants to solve our problems. One of the perks of home-grown foods is keeping the unwanted toxic stuff away. I learned from one of the children’s books that I read my kids that lady bugs eat aphids, so I thought we’d give lady bugs a try. The lady bugs were happy to be released from the bag and the kids were happy to try to tell them which plants were their new homes. While we stood there, several just flew away. The kids were full of excitement as the lady bugs buzzed around us. Like I said, I would do this again just for the kids. Look at that little hand trying to hold the lady bug. Totally adorable. Since our release didn’t really “work”, I’ve researched it a bit and have learned there were some things we could’ve done differently. I’m not sure we had enough flowering plants to keep the lady bugs interested in staying around our backyard, so I think we will try again after I plant some flowers in containers (on my to do list anyway). In the meantime, two nights ago we found two frogs in the driveway and moved them to the backyard. 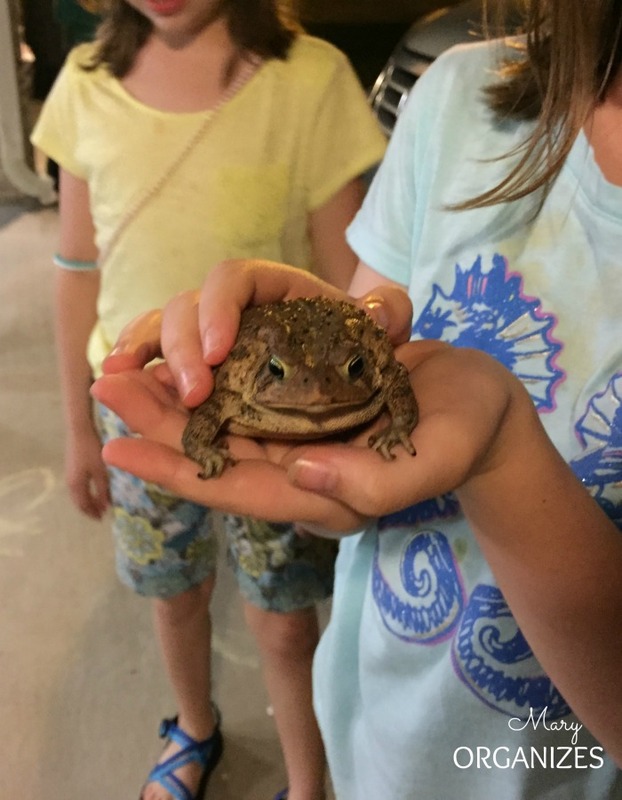 My kids decided he was our pet. We saw the big one in our garden patch tonight. Maybe he’ll eat all the bad bugs. Wait … do frogs eat lady bugs? We will keep plugging away at our organic garden. Any organic gardening tips? Please share! My mom grows raspberries and black berries and other bush berries and she says they always appear to die after transplant then come back. 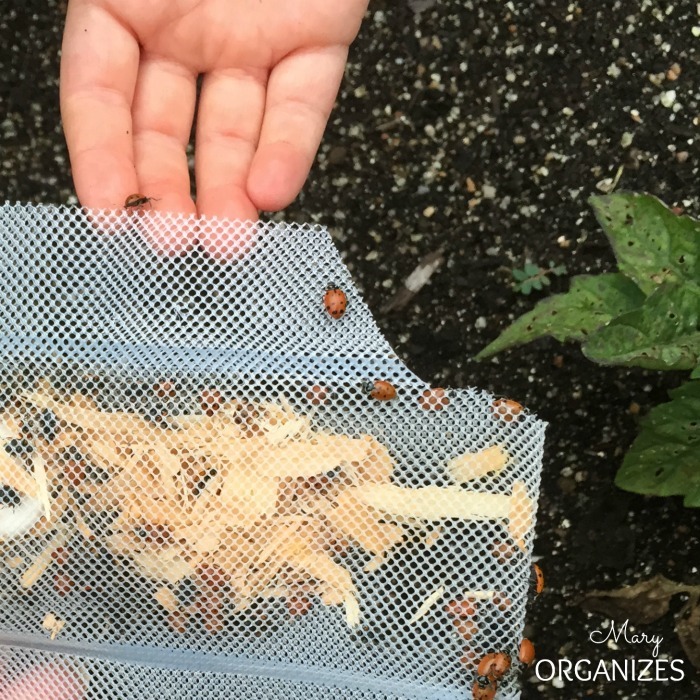 Even if they lady bugs didn’t work at first, what a cool activity! That is so cool to know that my rogue blackberry bush is quite common. We have gotten such a kick out of the surprise of it coming back to life! I had forgotten to mention. Basil is a natural aphid detourent (ugh can’t spell this early) we had them terrible on my roses. Last year we planted basil all around them and there were no more aphids. Plus basil is delicious! And basil smells soo good! Great idea. Full disclosure I use doTerra essential oils and this site is using doTerra essential oils but that doesn’t mean other good quality essential oils wouldn’t work as well. From my experience, ladybugs will leave if they have eaten all they can find– so if there are no more aphids, they’ll go find some somewhere else. That said, I have also read that if you spray your plants with water and release the ladybugs in the evening, they tend to stay for a drink and a nap and wake up ready to eat in the morning… and therefore more likely to stick around longer and do more work. 🙂 You might also try praying mantises– you can order the eggs or sometimes buy them at your local nursery and they are VERY fun for the kiddos to watch hatch. You can put the eggs in a little terrarium and then release the babies (so long as you’re not too squeamish- each egg holds maybe a hundred tiny little bugs!) They do a really really great job cleaning up the aphids etc. as well! I bet my kids would LOVE the praying mantises! And we’d keep the terrarium outside. 🙂 You might just see a post about more pet bugs this year or next. Ha! Our roses keep tons of ladybugs! Maybe try a rose bush! Win-win, because I love roses! 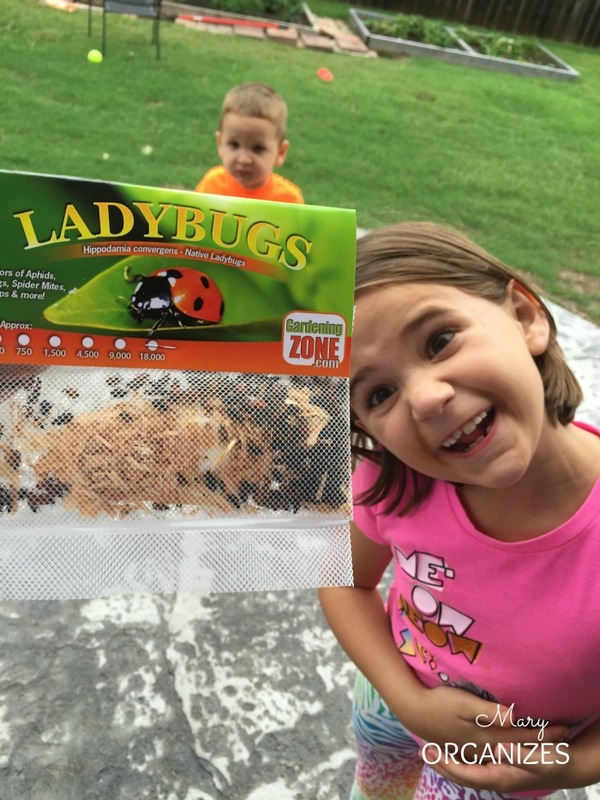 You can buy kits to hatch ladybugs, and butterflies. Really neat for the kids. My Class raised butterflies every year. Another teacher did ladybugs. I think you can also get frogs. Those sound awesome! Butterflies sound really fun. Thanks for sharing!